Aim for the stands and knock em' outta the park! 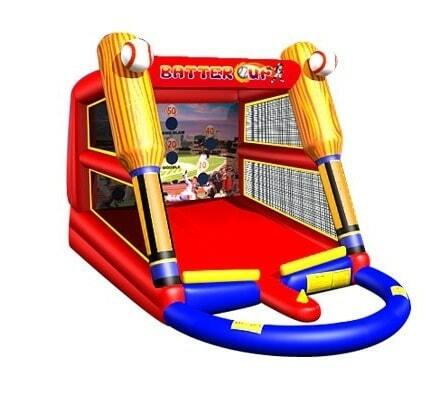 This awesome interactive inflatable baseball game is perfect to keep all your little sluggers entertained at your next event! Players walk up to the plate and bat baseballs into the enclosed outfield backdrop. The backdrop includes several target holes, each worth between 10 -50 points for each hit! This game is great for both left and right-handed batters and does exceptionally well at carnivals, church festivals and school fundraisers. Includes bat and 5 baseballs. Capacity: 1 participant per turn. Minimum space: 23'L x 16'W x 15'H.